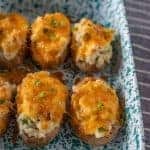 Twice-baked potatoes are a side dish made with baked potatoes that are stuffed with bacon, sour cream, cheese, and green onion and then baked a second time. I love a party, and I love party food. Some foods in life just scream celebration, and this recipe is one of those. I don’t often make these decadent potatoes, but when I do it is because there is a reason to celebrate. The reason this time was a friend’s birthday. I love when people have requests because it takes half of the work out of cooking for me. He wanted pork roast, twice baked potatoes and angel food cake with raspberries. Mmm, now that was a birthday meal fit for a thirty year-old! These potatoes are always a huge hit around here, and I know you’ll love them too. 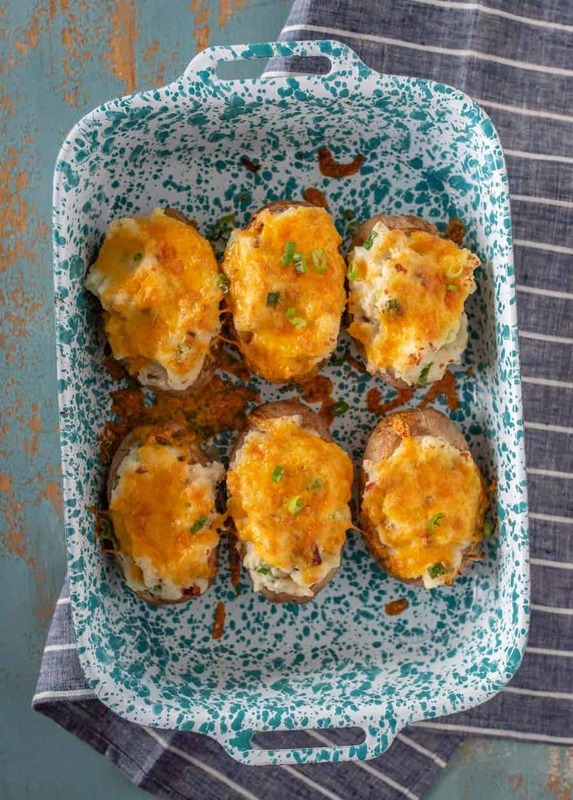 You can’t go wrong with hollowed-out potatoes refilled with the mashed potato, sour cream, bacon, cheese, and green onions. Bake it for a second time and you have the title of the recipe: twice-baked potatoes. I think you’ll find a reason to make them if you look hard enough. Heck, just make them for dinner tonight; your family will thank you. 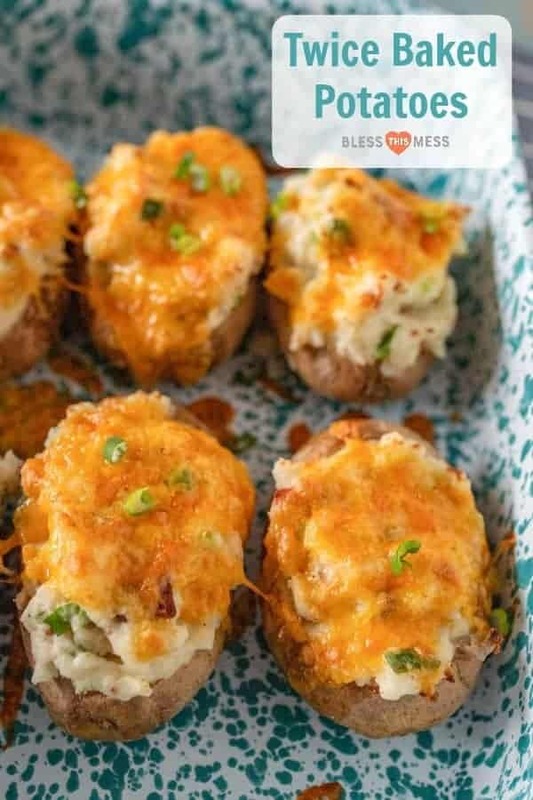 This is a very family-friendly or party-sized twice-baked potato recipe. If you are looking to make huge twice-baked potatoes, just switch out the medium potatoes for 5 or 6 of those larger-than-life baking potatoes, and proceed as directed. The big ones are practically a meal on their own! Don’t need 10-12 servings of this recipe? Feel free to cut the recipe in half. Can twice-baked potatoes be made ahead of time? Yes! This is a great recipe to make ahead and pull out of the refrigerator when you are ready to bake! I’ve made these a whole 24 hours ahead of time and they were still perfect. Once the filled potatoes are topped with cheese and bacon, cover and refrigerate until you are ready to bake. When baking the potatoes cold, cover the dish with tented foil (so the cheese doesn’t stick to it) for 30 minutes at 350 degrees F. and then remove the foil and bake for an additional 10-15 minutes until the cheese is melted and bubbly. Can you freeze twice-baked potatoes? Yes! Most potatoes get weird in the freezer and their texture is compromised, but these freeze great. Follow the recipe as directed but don’t bake them a second time. Wrap them up in foil individually and then stick them in a large zipper-top freezer bag. Freeze for up to two months. Unwrap and bake thawed potatoes for about 45 minutes and frozen potatoes for 1 hour and 15 minutes. Keep them covered lightly with foil until the last 15 minutes of baking so that the cheese doesn’t burn. 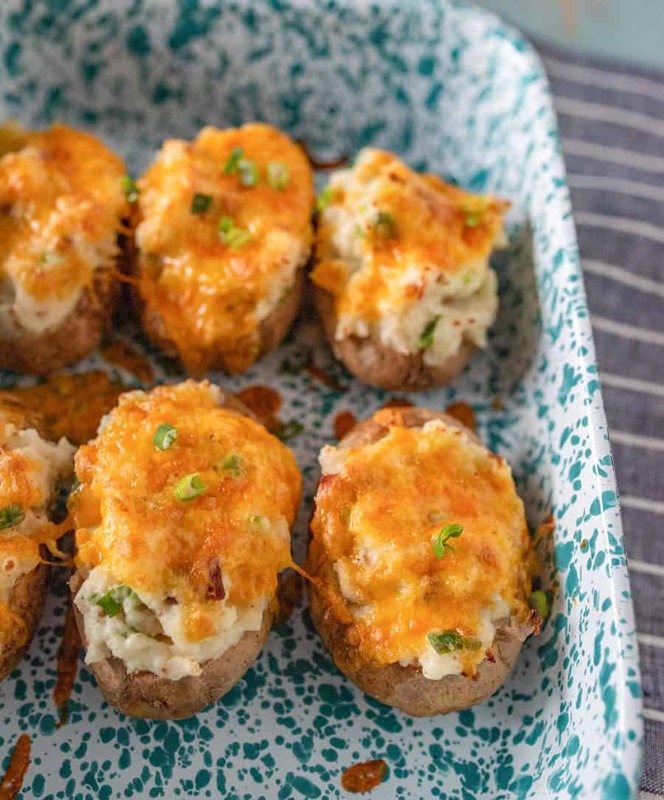 How do you reheat twice-baked potatoes? You can stick them in the microwave until heated through or reheat them in the oven for about 20 minutes. Start by washing all your potatoes and baking them. Bake them at 450 for about an hour (full post on how to bake a potato here if you need more directions). If you are in a time crunch, you can also wash and then stab the potatoes with a fork a few times and microwave on high for 12-15 minutes until the potatoes feel soft when pressed. I prefer the oven because the skin crisps up nicely. The initial baking method doesn’t really matter much here. When the potatoes are cooked through and cool enough to handle, cut off the top quarter of each potato. Use a spoon to hollow out the baked potato leaving about a 1/4 inch of potato near the skin. Put everything you scoop out of the potatoes into a large bowl. Once all of the potatoes are hollowed out transfer them to a large baking dish with sides. Add the sour cream, milk, and fat (bacon drippings or butter) to the bowl with the baked potato insides and mash them to make thick mashed potatoes. If they are too dry, add a bit more milk and mash some more. Add three-fourths of the bacon, 1 cup of shredded cheese, three-fourths of the green onions, salt and pepper. Stir well to combine. Taste the potato mixture and add additional salt and pepper as needed. Using a spoon, transfer the delicious potato mixture back into the potato shells. Be sure to press the filling in well with the spoon so that it fills the potato completely. You’ll have more than what you started with so just keep adding to the filled potatoes until all of the mixture is gone. Top filled potatoes with the remaining 2 cups of cheese and reserved bacon. Bake the filled potatoes for 25-30 minutes in a 350 degree F. oven until the cheese is melted and bubbly. Remove from the oven and garnish with the rest of the chopped green onion. Serve hot. This is a great thing to make ahead and pull out when you are ready to bake! I’ve made these a whole 24 hours ahead of time and they were still perfect. 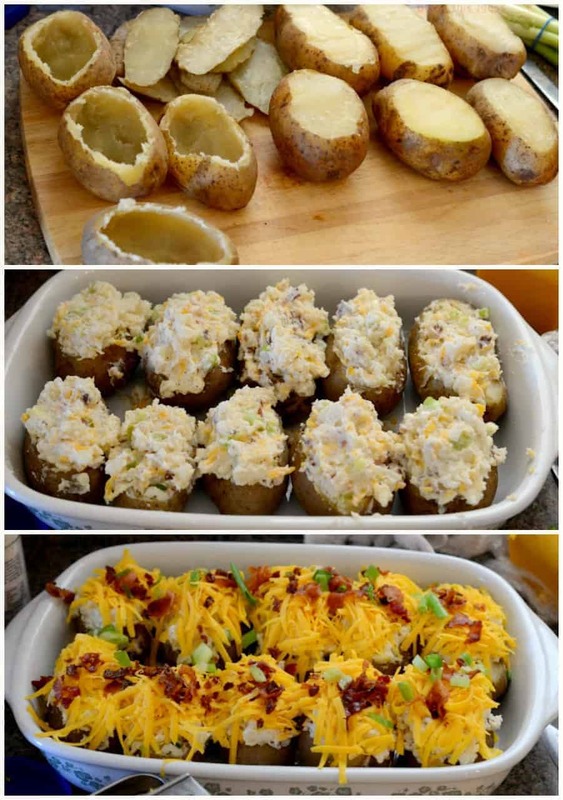 Once the filled potatoes are topped with cheese and bacon, cover and refrigerate until you are ready to bake. When baking the potatoes cold, cover the dish with tented foil (so the cheese doesn’t stick to it) for 30 minutes at 350 and then remove the foil and bake for an additional 10-15 minutes until the cheese is melted and bubbly. This is a very family-friendly or party-sized twice-baked potato. If you are looking for huge, just switch out the medium potatoes for 5 or 6 of those larger-than-life baking potatoes, and proceed as directed. The big ones are practically a meal on their own! What goes with twice-baked potatoes? There you have it – one delicious potato recipe that will have your family cheering your name at dinner. Find a reason to make these soon! omgggg! these look sooooooo good!!! Just a thought. With the tops of the potatoes, you can do almost the same for a nice pub style snack called potato skins. Once you have the tops off the potatoes, set them aside in the fridge till in the mood for an evening snack. Put the potatoes skin side down in a flat pan, put the same type cheese, bacon bits, and onions on the tops, put them in the oven to bake for a few minutes, then enjoy with the remainder of the tub of sour cream you did not use. You could do this after cooking the original potatoes to use the same pan, and just warm them up when you want them. This way you don’t end up tossing the skins out, use up the leftover sour cream, and end up with no leftovers. These are soooo delicious. I still remember when you made these for Valentine’s Day 2003. I did this differently, I had some bad potatoes, so I had to peel all of them…used only good ones, pre-cutting the tops, wrapped them together in foil & baked for an hour on 350 degrees, while they were baking, I prepared the stuffing mix, using left over gravy, adding bacon, capsicum, cheese, onion salt, diced tomatoes & chopped chives. I mixed together & heated in the microwave. After both the potatoes & mix are ready, I add the sour cream with extra cheese. Then ready to eat. I have salad to serve it with if desired. A meal in itself. Sounds delicious! Thanks for sharing your tips!